With IRP, Chausson is true to its goal of high-quality manufacturing. Whether the version is Flash or Welcome, our structures are all madewith the same high standard of quality. IRP is a major innovation that provides better insulation, greater resistance and improved protection. 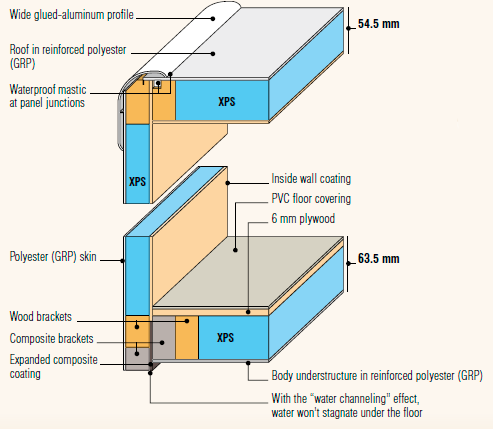 XPS insulation, an extra-firm foam with high sound and thermal insulating power. Specially designed floor and roof thickness for insulation that exceeds the usual norms. provides greater resistance to scratches, minor impacts, gravel, hydrocarbons, ultraviolet radiation and bad weather in general. among the best on the market, offering greater resistance to loads and limiting deformation over time. reinforces the structure of our walls and floors by combining composite longevity with the exceptional sturdiness of solid wood. all materials in contact with the exterior are rot-resistant and insensitive to humidity. On the inside, we prefer high-quality wood. N.B. : because of its particular shape, the roof of our overcabs uses a specific technology. Against leaks because of our rot-resistant materials and wide aluminum profiles that are glued on instead of drilled. Against storms because of the polyester (GRP) covering that limits damage from hail (on the roof and walls) or salt (under the floor). Against heat, cold and noise because of polyester (GRP) and a rarely matched insulation thickness. For 35 years, our goal has been to continually improve comfort and durability; we are convinced of the effectiveness of our technical choices and manufacturing processes. Standing behind our convictions, we offer you a seven-year warranty on water-tightness, subject to an annual check-up by a certified member of our network.